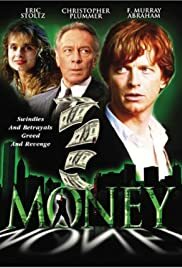 A young man whose father's fortune was stolen by his closest friends sets out to get revenge in this odyssey through the world's major financial centers. Rich kid, raised parentless by a faceless trust fund, is unceremoniously tossed out into the world on reaching his majority. We are to believe that this raw kid, dead broke and in a foreign country, can make himself wealthy in a matter of days (and pick up the sweetest girl) then make himself a multi millionaire in a few weeks and find the men who robbed his daddy. (this much is on the video box). A certain suspension of disbelief is required to follow this plot line. It might not be so bad but for the films use of the odd European device of having an unseen announcer periodically tell you what is happening. "She gets up to leave. She is upset. He has the feeling this is the last time he will see her". I suppose the makers of film in europe feel they must make sure all the audience is following the plot. The viewer has the impression he/she is being spoon fed a story that is not at all deep to start with. The movie is a success in that watching the screen, we are led to believe that a rapidly exchanged series of still images is seen by the human eye as people and things in motion. More than that, it is not.